Rabbits, unlike ferrets or other small animals, don't give off odors of their own; most of the odor associated with keeping a rabbit comes from the cage. 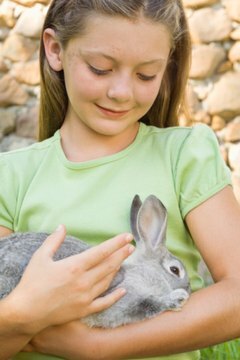 Deodorizing the cage and keeping the home smelling rabbit-free isn't difficult, and a few extra steps in the setup of the cage and training of the rabbit will make this considerably easier. A clean cage will mean a happy, healthy rabbit and will make the home free of any unwanted odors. Litter train the rabbit. Rabbits are creatures of habit and are fastidiously clean and tend to eliminate in the same place all the time. Place the litte box in the area the rabbit as selected for its bathroom corner. Droppings and urine are the main source of smell in the cage, and being able to remove the litter pan to clean regularly is easier than cleaning the whole cage. Change the litter in the box frequently. Rabbits are known for eating some of the litter and bedding in their cages, so use something organic such as hay or alfalfa as litter. This will not harm the rabbit should it eat some, and will also absorb odors and smell fresh. Replace soiled bedding as needed. Litter boxes should be emptied every few days and wiped clean with soap and water. Do not use harsh cleaning chemicals, as the odors left behind can cause health problems for the rabbit. Give the cage a thorough cleaning at least once a month. Empty out all bedding, toys and dishes. Scrub the bottom of the cage with a mild bleach solution, using no more than a capful for a gallon of water. After scrubbing with this solution, wash the cage with soap and water to remove any bleach that has been left behind. Let the cage dry completely before putting everything back inside. Spaying or neutering the rabbit will stop many unwanted behaviors and eliminate a lot of odors by decreasing the hormone activity of the rabbit. Feed a regular diet; changing the rabbit's food can also result in some unwanted smells and the mess of diarrhea. Some types of litter are not recommended for rabbits. Litters that release dust can make them susceptible to illness and respiratory problems, and cedar chips can cause liver damage when oils are ingested. Do not add baking soda to litter as it can cause numerous internal issues as well as death. Never use cat litters with deodorizing crystals, as these can be dangerous when ingested.